Name of Uluwatu was come from the word Ulu meaning the head and Watu meaning stone. 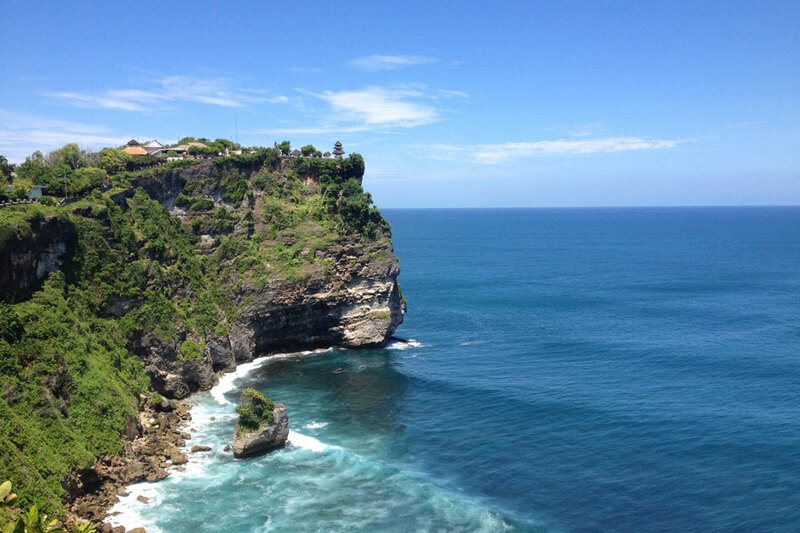 Therefore Uluwatu Temple mean the temple built in tip of coral reef. It was built in the 11th century. This temple is a Hindu temple set on the cliff bank in south part of Bali Peninsula. 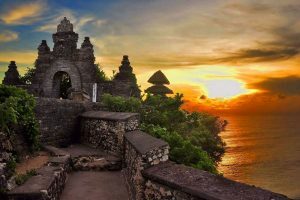 It is one of six big groups of Bali Temples,located in Pecatu Village, Sub district of South Kuta, and Badung Regency . It is situated on the coral reef sordid to sea about 80 meters above the sea level. It is featured by a small dry forest which is mostly called by Alas Kekeran (interdict forest) which is belong to the temple and dwelt by a lot of monkeys. Kecak dance performed on the eastern side of Uluwatu Temple. 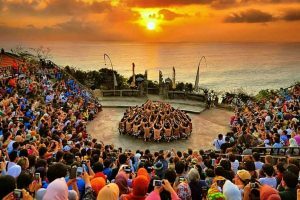 The Kecak dance performance is very simple. The men’s chorus chants the words Cak ke-cak ke-cak ke-cak ke-cak ke-cak, in rhythm, over and over again, For this reason they are called the Kecak or Cak dance. 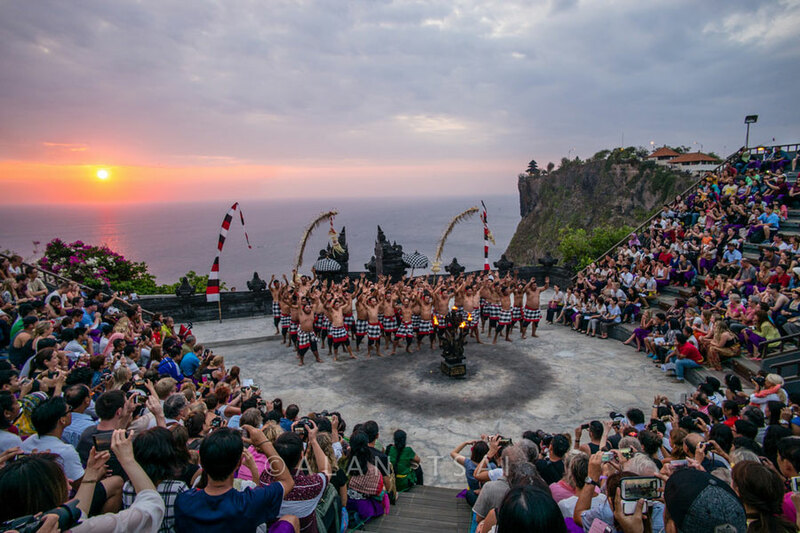 The Kecak dances consist of about fifty men wearing only a loin-cloth, the upper part of their bodiesleft bare. They form rows of circles, in teh middle of which is a coconut oil lamp. The Kecak dance is performed for dance-dramas and the story presented is take from the Ramayana epic. Jimbaran located in south of airport, the beach has white sand. 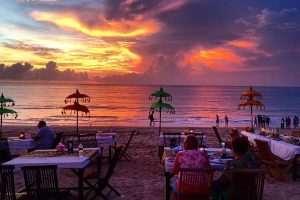 This place is a favorite tourist spot in Bali, offering a variety of well known attractions such as the center of seafood (Seafood center) and the atmosphere that night Jimbaran beach is beautiful and romantic.Jimbaran village known as producer of fish, where most residents work as fishermen. 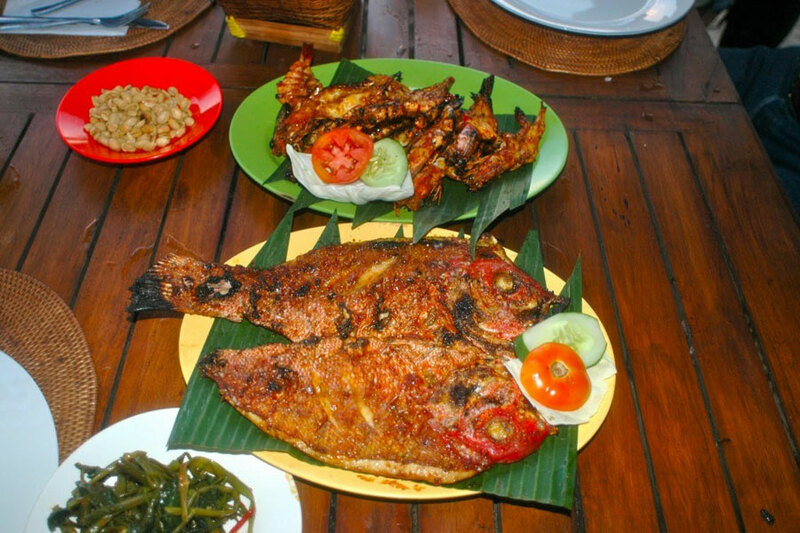 And over time the many who took the initiative to establish a restaurant / cafe for the preparations of seafood today. You can enjoy seafood while you are enjoying the coastal scenery, filled with a peaceful atmosphere.The atmosphere and beauty of the setting sunset and splendor of tourists enjoying dinner at the cafes along the beach provides a variety of food seafood, especially grilled fish, with its distinctive aroma and flavor are invited to taste. The price depends on how heavy the fish you messages.